I have some fun news to share with y'all today. Bob’s Red Mill Natural Foods is looking to crown a United States Porridge Making Champion to represent the company at the international competition in Scotland. They're calling on oatmeal lovers across the country to enter their best oatmeal recipe in their third annual Spar for the Spurtle United States Porridge Making Championship. Oatmeal lovers are being asked to submit a video showing an original recipe that makes use of Bob's Red Mill Steel Cut Oats. Bob's will select three finalists and fly them to Portland, Oregon (an amazing city, by the way!) to compete in a live cook-off. 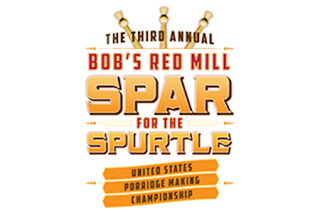 The winner of the cookoff will travel with the Bob's Red Mill team to compete in the 20th annual Golden Spurtle World Porridge Making Championship in Scotland in October! Bob’s Red Mill first competed in the World Championship in 2009, becoming the first American contenders to do so. That year, Bob’s won the World Championship and the highly coveted Golden Spurtle trophy. A spurtle is a Scottish kitchen tool dating back to the 15th century that is traditionally used to stir porridge and prevent it from becoming lumpy. 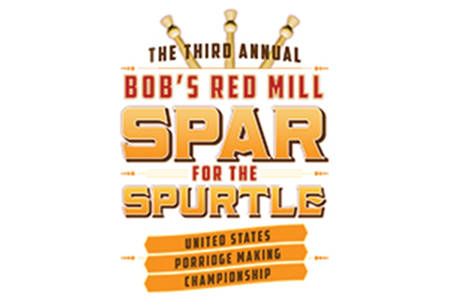 Anyone interested in entering the third annual Spar for the Spurtle should visit the Spar for the Spurtle official website to submit a video demonstration of an original recipe that makes use of Bob’s Red Mill Steel Cut Oats OR Gluten Free Steel Cut Oats. Videos can be no longer than three minutes and should demonstrate a creative use of the oats. Dishes can be sweet or savory – they just need to be cooked on the stovetop and able to be created from start to finish within 30 minutes. 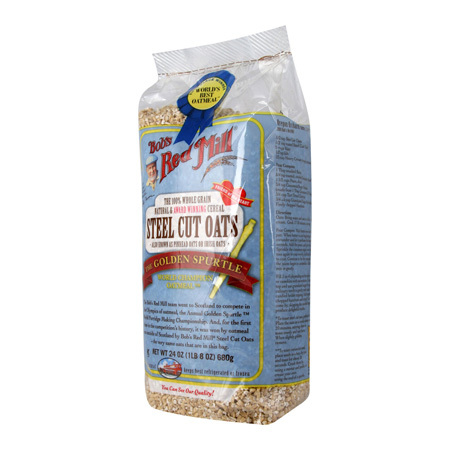 Bob's Red Mill sent me some of their Steel Cut Oats to share a recipe with you. I had never tasted or cooked them before, but now I'm hooked. They're nutting and chewy...and full of healthy fiber! I normally associate oatmeal with cold weather, but I found a great recipe for Strawberry Baked Steel Cut Oatmeal at Family Fresh Cooking. Marla's dish looked so amazing that I fired up my oven to bake some steel cut oats. I made a few tweaks to her recipe for my Mixed Berry-Almond Baked Steel Cut Oats. Marla's dish is vegan-friendly and absolutely gorgeous. In addition to halving her recipe, I made a few tweaks to suit our tastes. We like our oatmeal pretty sweet, so I added a bit of brown sugar and maple syrup to my mixture. I also added vanilla bean paste, cinnamon and fresh nutmeg. This one's a keeper...and it works just as well for dessert as it does for breakfast! Step 1: Preheat oven to 375. Lightly butter an 8x8 baking dish. Add the following ingredients to a large mixing bowl: 2 cups sweetened Almond Breeze vanilla, 1 cup light unsweetened coconut milk (NOT cream of coconut! ), 1/3 cup pure maple syrup, 1/3 cup packed light brown sugar, 1/2 tsp. salt, 1/2 tsp. baking powder, 1 tsp. cinnamon and 4-5 grates of fresh nutmeg. Whisk well to combine, until the brown sugar is dissolved. Step 2: Add 1/2 cup blackberries, 1/2 cup raspberries, and 3/4 cup Bob's Red Mill steel cut oats. Stir well to combine and pour into the prepared pan. Bake for approximately 1 hour, until the oatmeal is bubbly and thickened. Make sure to turn the pan around halfway through baking. Note: the oatmeal will continue to firm up and thicken as it cools. Step 3: Let the oatmeal cool for at least an hour before serving. Before serving, top with quartered strawberries (approximately 7-8), 1/2 cup blueberries, and 1/2 cup sliced honey-roasted almonds. To serve, spoon into bowls. You can serve with additional maple syrup drizzled on top...it's optional, but very tasty. Wowza...is this oatmeal fatastic! It's nuttiness works really nicely with the almonds, and the combination of fresh and baked berries provides different textures and flavors. This dish was just sweet enough for us -- we actually had it for dessert the night I made it. Refrigerate the leftovers in a covered container and simply reheat in the microwave for 30-45 seconds. It makes a really great portable breakfast...simply spoon into a plastic container and heat it up at work. I can't wait to make some more fun variations on this baked oatmeal. Using the basic formula, you can vary the fruits and nuts used. Disclosure: Bob's Red Mill sent me a package of the Steel Cut Oats to facilitate this post. The opinions expressed are solely my own.